Thankful Thursday - The Ever Changing View — Your Creative Connection, Inc.
January 11, 2018 Your Creative Connection, Inc. I am thankful daily for the view outside my studio windows which is indeed ever changing. My husband built our side-by-side studios in our walkout basement which looks out on our backyard and the natural creek area below. This month's dusting of snow reminds me of these iced oatmeal cookies from back in the day...less than an inch of snow on the browned grass of winter always brings this image to my mind. The play of light upon the delicate web of bare branches reveals treasures unseen in the leaf and blossom-filled seasons of spring and summer. And the limited color palette this January Thursday is in stark contrast with the blazing colors of warmer days. Then there are the animals. The creek runs through our neighborhood behind and below the street level and attracts deer, foxes, squirrels, raccoons, groundhogs, moles, rabbits, opossums, and the occasional snake, all of which I've seen at some point while gazing outward. We also have a mother cat and at least one kitten who visit (and yes, I'm a softy and I feed them). We fill our bird feeder year round with black sunflower seeds, and the list of frequent diners includes: finches, wrens, juncos, sparrows, woodpeckers, flickers, mourning doves, cardinals, titmice, mockingbirds, robins, nuthatches, thrashers, towhees, blue jays, starlings, grackles, bluebirds, and chickadees. Other visitors to the creek area, heard but rarely seen are owls, hawks, and in one amazing event, 11 white cranes! Beginning in late Spring and throughout the Summer, there are at least two hummingbirds which call my nectar feeder their private territory (much to the peril of any others who try to horn in! ), and I love watching their antics right at my center window. So here, for your viewing pleasure (as it certainly is mine) is a collection of the wild and not-so-wild life I've observed over the years. Fox, not ready for her close-up, apparently. A young raccoon, contemplating his next move to capture a bird. He didn't succeed. "Socks" (not our cat) peeking in to see if I'm coming out to feed her. Fox siblings near the plum tree, about to go under the fence to the creek area below. Baby groundhog in a tomato planter. Did you know that groundhogs, or woodchucks are called 'whistle pigs' in the UK? It's because of the sound the mother makes to call the young ones. 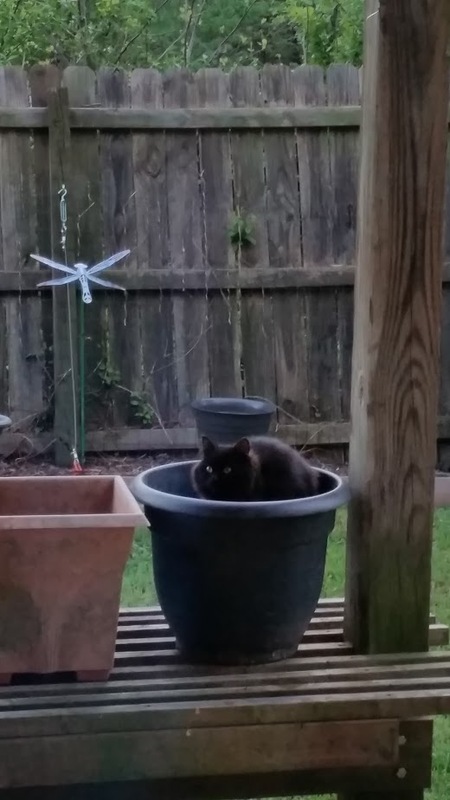 "Midnight" (also not our cat) making himself quite comfortable in a pot under the bird feeder. And yes, that's a very long (54" by our estimate), allegedly harmless (I didn't stay around to find out) black snake moving along the fence. It was fascinating to watch (from a safe distance) it go from the grass up to and across the fence. So until next time, enjoy your own version of the "ever changing view."